Thank you for reporting this issue, unfortunately this is not in our jurisdiction as it is MassDOT property. We will forward this report appropriately. Note: Hundreds of gallons of mosquito breeding standing water in an improperly installed pool cover. Thank you for reporting this issue, we will have ISD review the situation. All poll covers are willed with water at this time. We will revisit this in a couple of weeks. Loose wires at property. Unsafe conditions. There’s a loose wire blowing around this property, the utility pole, and the adjacent sidewalk. See, Click Fix members are so good and really care for the community and the residents. Thank you being the eyes for a better Chelsea! This is a MassDOT project not under the control of the City. Ramp is close to completion, but the City has no way of expediting final construction. Owner was notified and this problem is being remedied. Terrible pot hole on Eastern Ave going to Chelsea Street Bridge where the speed limit is 40mph making impossible to avoid it without Swerving. The pot hole was so deep that the hub cover on my wheel came off and I had even feared my tire had popped. Eastern Ave. in this location still currently remains under the jurisdiction of the Massachusetts Dept. of Transportation, not the City. We will notify MassDOT. corner of 60 dudley private residence building was vandalized with graffiti last night. please have city clean it off. thank you! It’s in two other places down Spencer on the same building. I believe the owners of private property are responsible for cleaning it themselves, not the City. various cars park there most of the time. follow the directions just given. hope for the best. It's a holiday weekend. Don't expect any response or action from parking enforcement nor police. All parking issues are ignored or acknowledge weeks after they have reported. Waste of time. I have reviewed this complaint to determine the details of the problem. This lot that has been identified is in tax title for non-payment of taxes. The City is currently in Land Court seeking an Order of Foreclosure so we can own the parcel. Unfortunately, the current "owners" are scattered heirs of an estate, and some of the heirs have unknown whereabouts. That has caused significant delay in the Land Court procedure. Giving tickets for this zoning violation would be an exercise in futility, because there is no available owner who will respond. The City is seeking prices to install a fence on the property while we await the Land Court procedure to be resolved. Unfortunately, until we install such a fence, we have no way of preventing parking. We cannot tow vehicles because, as stated above, we do not yet have any ownership interest in the property. I will close out the other Item and leave this open until we are either able to install the fence or obtain the Land Court Order that we are pursuing. 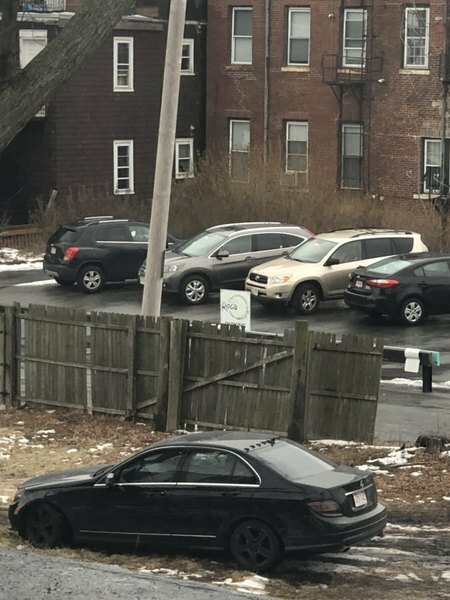 Cars have been parking on the grass on the abandoned ROCA lot on Ellsworth Street regularly lately. Per city ordinances this is a violation. Not sure if it’s ROCA employees or residents on 36 Hawthorne, but an eye sore. Only 2 cars parked on the abandoned grass lot today on Ellsworth in District 6. This moped is almost blocking the sidewalk please check it out. This should be reported directly to Chelsea Police Department. Thank you for reporting this issue, we will have the Police review the situation. Is there a community garden program and who manages it? Where do I get rid of green waste (grass clippings, branches, etc.)? Has anyone been to the 'Psychic Shop' with the BRIGHT neon sign at 27A Williams Street?